Cassia block of Brigade Millennium in J P Nagar has its own unique steel bins system which has been producing one tonne of compost each month. Bangalore’s roads run like tedious arguments. 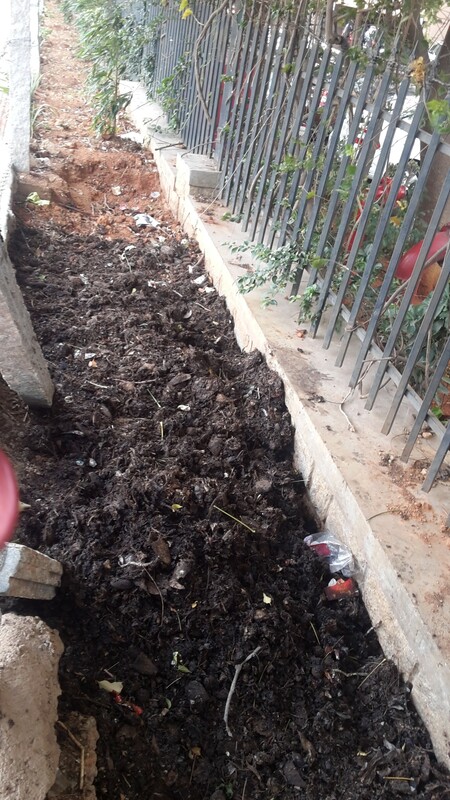 I had to meander my way around one such ‘argument’ recently by hitting the road at 7 am in Yelahanka to study a community composting method in an apartment located in J P Nagar. Cassia Block is just like any other nestling in this mammoth condominium called Brigade Millennium. But it stands apart for its high eco quotient nurtured by its all-woman management committee. They have a very good waste and water management system in place and in fact, the residents have stepped out of their threshold, cleaned up a spot just out of their periphery, planted a line of trees and have even set aside some space for vermi-composting right there. Now, that definitely sets the tone for this write-up, doesn’t it? Cassia’s large-scale composting system stands out for one reason: its steel bins which are light and portable. The technical expertise of Shobha Raghavan, the woman behind this design and implementation, shines through this experiment which has worked to her expectation without any hiccups for over a year. Being Lead- Technical and Business Development with Saahas Waste Management Pvt. 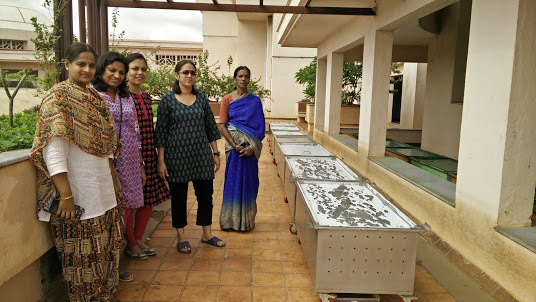 Ltd., Shobha has studied some composting methods available in Bangalore. But space crunch at Cassia posed hurdles and none of the known composting models could fit in. That’s when she came up with this steel bin design which is “portable and easy to operate”. This is a system designed for 190 flats. Currently 167 have been occupied generating around 100 kgs of wet waste every day which may go up to 125 kgs on holidays and festivals. There are two sets of steel bins: the first seven are meant for processing fresh wet waste and the second set of seven bins are for curing. The first set is made of stainless steel to withstand the challenging internal environment during the first few stages of composting. The size: 2f x 4ft (L) x 2ft (H). Each bin takes in one day’s kitchen waste mixed with dry leaves scooped up from the community garden. The bins have enough holes on all sides to let the air in and are fixed with sturdy wheels making it very comfortable for the staff to move them around as needed. The lid is easy to operate with hooks on two ends. The bottom has a hole which lets out leachate. A plastic tray is placed at the bottom to collect the same. The second set of seven bins is made of mild steel which are smaller in size: 2ft x 4ft (L) x 1ft (H). They are meant to process the 7-day-old semi-compost. Cassia also has a shredder placed in a waste processing room at the ground level. Segregated kitchen waste collected in large buckets. Kitchen waste is shredded using this shredder. Sawdust or wood slivers is mixed with the waste to absorb extra moisture. Workers turning the piles in the bins. Seven bins for seven days. Composting in progress under the sun. This is how semi-done compost looks after one week. These are smaller second set of bins meant for curing. One-week-old semi-done compost left to stay in these bins for one more week. On the 15th day, compost is taken out and dried a bit to remove extra moisture. Fine compost goes for the lawns in Cassia. Cassia produces one tonne of compost each month. There isn’t much to write about the process per se as the steel bins themselves make the operation easy. 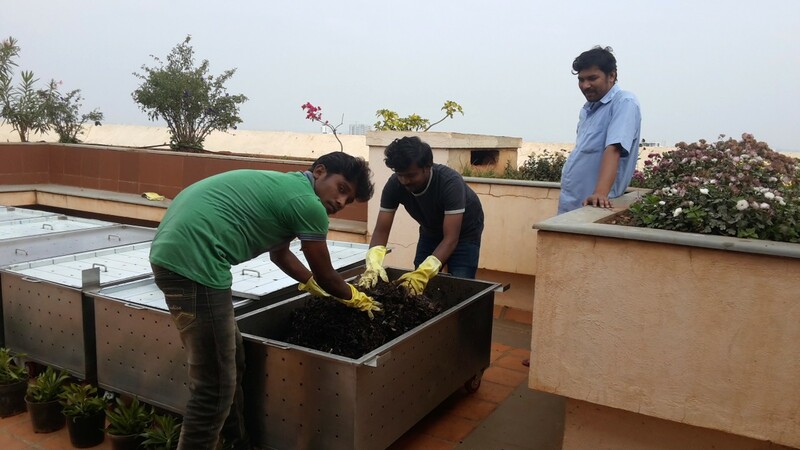 According to Shobha, the bins retain the heat on the open terrace helping in quick composting. The staff members collect the kitchen waste from each home, shred it and mix it with dry leaves. They use sawdust when there isn’t enough brown component available. The seven bins take in one week’s waste. Each pile is turned once a day and the bins aerated well to make sure there are no air-blocks in the composting piles. The sun dials up the heat thereby speeding up the decomposition. On sunny days, the temperature goes up to 65-70 deg. C., killing pathogens and other disease-causing agents. Thanks to the airy surroundings, there is no need to fix any fans or air-blowers. On the 8th day, the half-done pile from the first bin goes into the first bin of the second set and it stays there for seven more days. On the 15th day, it is taken out and let to dry in the sun for a while to eliminate extra moisture. After sieving, the finer compost is used for the lawns whereas the larger chunks go to the trees and shrubs in the complex. When I visited Cassia, the two steel bin sets looked very neat and there was no odour issue. 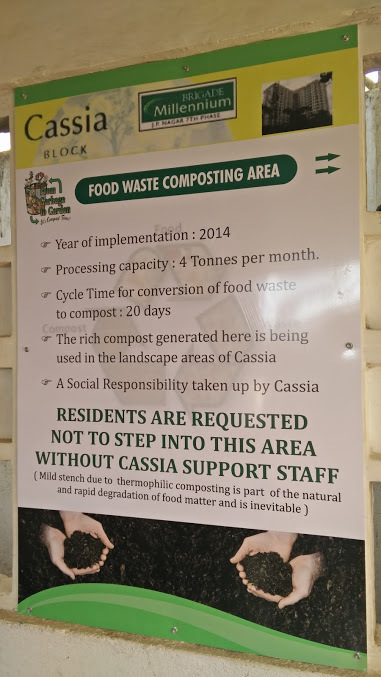 The Cassia green volunteers have put in place an efficient waste management system for their community. The compost that comes out of this system is a reward for all their selfless efforts. The bins retain the natural heat quite well and this accelerates the composting process. Another plus point is the longevity and durability of the product. They are rodent-resistant, easy to clean and maintain. And yes, they are portable. If the space is needed for any other purpose temporarily, then you can even shift the bins and place them back later on. Although terrace is the perfect location, these bins can be placed on the open ground too where there is ample air and sunlight. The bins have to be moved under a roof on rainy days. This can slow down the process and hamper the compost turnaround cycle. Perhaps adding a couple more bins to the two sets may help ease the pressure on each bin as the waste gets distributed thinly into the extra bins. Secondly, if there is not a roof already, then some more capital expenditure goes in for building one. Cassia’s vermi-compost patch right outside their gate. The residents went on a clean-up drive, planted a line of Ashoka trees and sealed off a small patch for vermi-composting. This manure is used for the community garden. The capex for designing the total project ran into Rs 5,00,000 which includes a wet waste shredder, seven stainless steel bins (used for composting ) and 7 mild steel bins (used for curing). The Cassia set-up is meant for around 200 homes. For 100 homes, the capex may come down further. The opex, barring labour cost, includes saw dust when there are not enough dry leaves available from the garden. Throw in an accelerator, cleaning material for the premises, it all runs into Rs 1,000 per month. Contact details: Shobha Raghavan, shobha@saahaszerowaste.com. “We have got very good feedback from our gardener who uses the compost for our community garden… Our garden is blooming with a lot of flowers , fruits and vegetables now. We also grow lemons, chillies, brinjals, bittergourd in plenty,” says Shobha. Among the flowers, hibiscus grows in a variety of colours. Beautiful sunflowers and a variety of roses greet the residents each day. 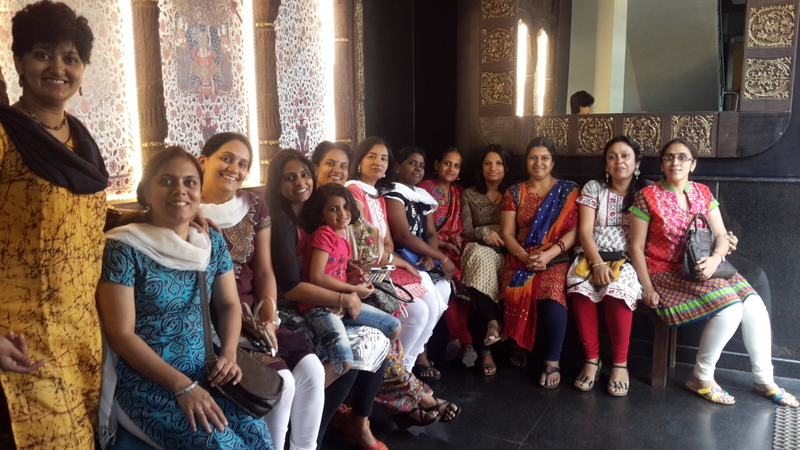 Members of the all-woman MC of Cassia block, Brigade Millennium, J P Nagar, led by Shobha Raghavan (first from right). But it took time to set up a composting system in place. The first challenge was to shut the garbage chute which can spoil even seasoned segregators. Composting started one year ago and since then, the community has produced tonnes of compost. It may take just one person to kickstart green initiatives, but it takes an entire community to nurture them, see them grow. Pics: Savita Hiremath & Shobha Raghavan. This entry was posted in Community Composting, Endlessly Green and tagged Brigade Millennium, Cassia block, community composting, Compost, steel bins composting system, waste managment in Cassia. Bookmark the permalink. Nice write up ! I liked ‘the streets that follow like a tedious argument’ ! The ‘overwhelming question’ is how much does a shredder cost ? This also means that ready to use compost can be made in 20 days ? A shredder may cost anything between 30k to 2L. It all depends on the quantity to be handled and the speed at which you want the shredding done. Please do search for MK Associates on the net. They have a range of machines for all quantities. And yes, compost can be out in 20 days, even 15 days. The method and the accelerators used decide everything. I am writing to you from Hyderabad where we are running a pilot and eventually want to scale to cover 750 houses. a. What is your compost: sawdust ratio? b. How do you handle leachate? Hi Madhumita, food waste coming out of 750 homes is huge. Close to at least 400 kgs/day. It is better if you pick a standard solution for composting. Using sawdust alone doesn’t work as you will need accelerators. Leachate can be controlled by using cocopeat and even dry leaves. But unless you are clear about the solution you want to work with, it’s difficult to answer such questions. Feel free to discuss more once you have picked a method. Thanks and good luck.